Closed on Sun., Mon., Holiday. 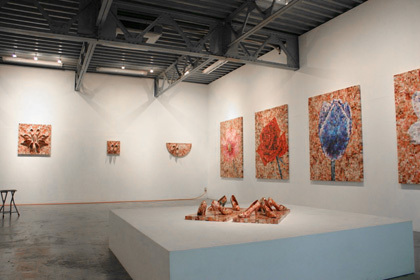 Itch − Kenji Ichikawa − has previously been selected three times for the Taro Okamoto Contemporary Art Prize Exhibition, and expected to do great things in the future. Hatch − Kotaro Hachinohe − previously belonged to the pivotal centre of the Japanese calligraphy world, and along with continued study, his future is one filled also with great expectations. Working day and night on his pieces, in a corner of Tokyo is Itch. Holding his brush day and night in a corner of New York is Hatch. While Itch’s Ikebana series and Hatch’s trace K series have been acquired by many overseas collectors, they are yet to appear on the horizon in their home ? Japan. 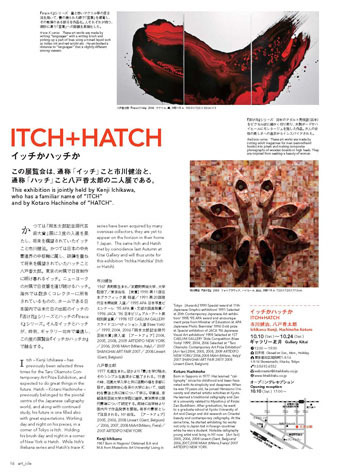 The same Itch and Hatch met by coincidence last Autumn at Kitai Gallery and will thus unite for this exhibition ‘Itchka Hatchka’ (Itch or Hatch)..
Born in Sapporo in 1977. Has learned “calligraphy" since his childhood and been fascinated with its simplicity and deepness. When he was 19 years old, he joined Hanazono University and started artistic activities at Kyoto. He learned a traditional calligraphy and Zen at a university related to Myoshin-ji of Rinzai Zen Buddhism. 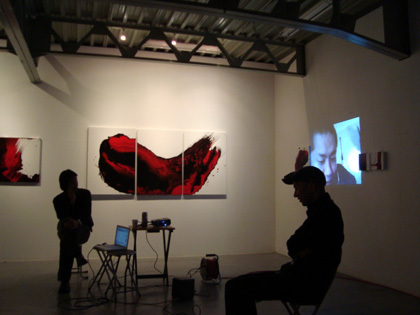 After graduation, he went to a graduate school at Kyoto University of Art and Design and did research on Oriental beauty and contemporary calligraphy. 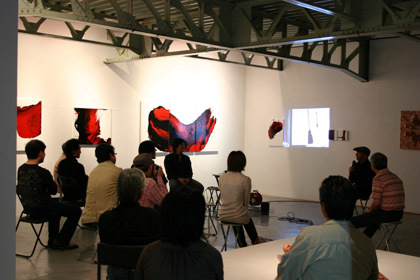 At the same time, he started exhibiting his works not only in Japan but in foreign countries while he was a student. Notable calligraphy young artist and living in NY now. 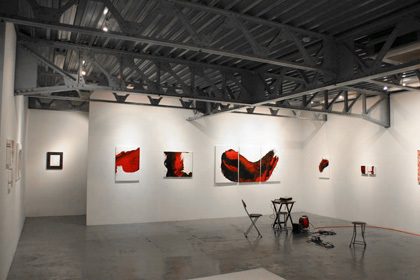 [Art fair] 2005, 2006, 2008 Lineart (Gent, Belgium)/ 2006,2007,2008 MiArt (Milano,Fiera)/ 2007 ARTEXPO NEW YORK. 日月祝 Closed on Sun., Mon., Holiday. Thank you for coming our opening party! !